Is your search is something chocolaty yet romantic to surprise your dearest beloved? 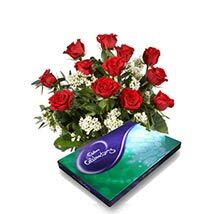 If yes then this then now you are definitely at the right place as here below is the exclusive catalogue for yummy and beautiful gift combo that is Chocolate with Flowers combo to explore. Impress Sweetheart with Chocolate with Flowers Combo! Flowers are one of the most cheerful and romantic gifts whereas Chocolates turn out as delightful and yummy gift. Thus clubbing both of these yummy and romantic gifting options here we have come up with unique Chocolates with Flower combo. It is the perfect Valentine gift not just to surprise and cheer up sweetheart with but also in enjoying romantic moments together. 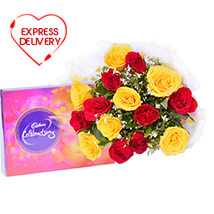 From the combo Flowers can be used to express heartily feelings of love, where as chocolates can be used by couples in taste yummy sweet treat together and in sharing some romantic time together. Thus from options like Color Blast, From my Heart, Perfect N Lovely, Roses with Dark Chocolate, My Fondest Affection, Heart Shape Love, Simple Mix, Yummy N Rosy, Roses with Chocolates, Colorful Surprise, Sweet Affection and more start your search for the best online Chocolate with Flowers combo right here.